REPSOL 10W50 Synthetic Engine Oil launched in India | IAMABIKER - Everything Motorcycle! 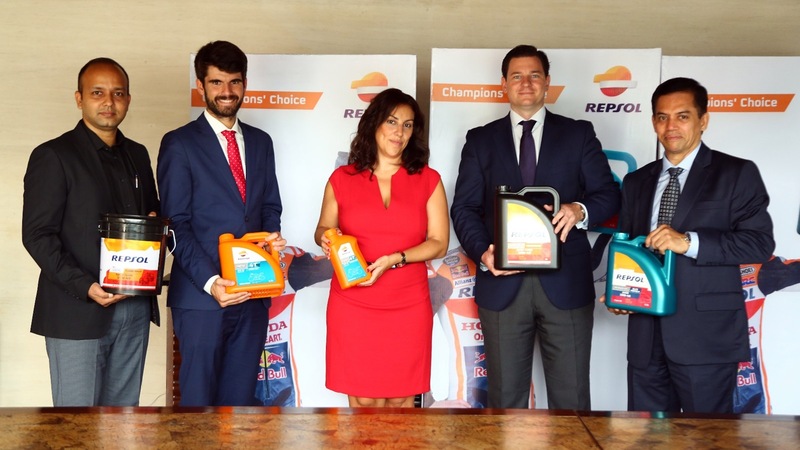 “We have received constant positive reinforcement from our customers towards the product line of REPSOL brand since its launch in April last year. Keeping in mind the consumer need and response to the previous products we decided to bring in the synthetic oil range in the Motor Cycle Oil (MCO) segment which will be first of its kind from Repsol in India. The market for synthetic oil is a fast growing one in India. This product will be targeted at any bike above 150 cc. Along with this product we have also introduced products in the Passenger Car Motor Oil (PCMO) and Commercial Vehicle (CV) category. We hope to continue this robust expansion and constantly add quality products to the lubricant industry portfolio” said Mr. Hari Prakash, CEO, GP Petroleums Ltd. The MCO Synthetic range follows the successful launch of Repsol’s Mineral range of Motor Cycle Oil (MCO) and is available as a world class Fully Synthetic product Repsol Moto 4T Sintetico 10W-50 and Synthetic Blend engine oil – Repsol Moto 4T Sport XTI 15W-50 in the Indian market. The formulation that is used possesses additional boosters taking RESPSOL MCO into the premium performance level. Repsol Moto 4T Sintetico 10W-50 is a fully synthetic product is known for its high performance levels, allowing optimised performance with longer drain intervals, excellent soot dispersion, anti-wear, anti-corrosion properties & viscosity stability in extreme conditions. Repsol Moto 4T Sport XTI 15W-50 is a part Synthetic premium engine oil, allows better performance with fuel economy. The advanced formula is best suited for technologically developed engines.